My name is Erik and my wife is called Ann-Marie. Our family name is Oskarsson. We have rented out our little guest-house since 1983. 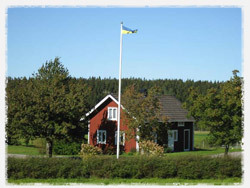 We live on the old family farm called Ljungkas which is in Hillingsäter just outside Färgelanda. For the last 30 years we have worked part-time on the farm and we have combined this with other jobs in the municipality. However, we have now decided to lease out the land. Nowdays we only have two cats on the farm. We are both around 60 years and our children have left the nest. My wife and I are both Swedish but I speak some German and English. When we’re not working we devote some of our spare time to bee-keeping.